US, 2007, 104 minutes, Colour. Billy Bob Thornton, Virginia Madsen, Max Thieriot, Jasper Polish, Logan Polish, Bruce Dern, Mark Polish, Jon Gries, Tim Blake Nelson, J.K. Simmons. What to make of this rather odd piece of Americana which tantalises with the juxtaposition of the two occupations of its title? The title, by the way, is like Good Will Hunting – it looks as if it means something but it is the name of the central character. Here he is Charlie Farmer, played by a genially obsessed Billy Bob Thornton. A strong caution is in order – not a moral caution because the film is quite a wholesome tale of family, hopes and dreams and values. No, the caution is a warning to hyper-realists. You will not like this film and probably think that the plot is not only implausible but impossible. Actually, the caution could well extend to ordinary realists as well. While it is all filmed as a realistic, even naturalistic, story, it is an American fantasy: anybody can achieve their dream, no matter what. So, this is the story of Charlie Farmer, his wife Audie (Virginia Madsen) and their three children who live on a farm in a small Texas town. So far, so ordinary. But, Charlie, with the help of his son Shep, has built a rocket in his barn and intends to go into space. When he rides around his property, he dresses in his space suit. Not only is the audience sceptical, so are some of the folksy townspeople although they come to embrace him and his cause. The media descend on the town as well. Most sceptical are NASA and the federal aviation officers. The FAA man to confront the would-be-astronaut Farmer is the no-nonsense, J.K.Simmons. He wants to forbid the whole project. More congenial is the NASA expert who has been in space. He is played by a nice Bruce Willis who tries to dissuade Charlie by reason and common-sense. If this sounds improbable, then this is not your film. Even trying to be sympathetic to characters and situations, it does seem highly unlikely that a farmer and his son could build a spaceworthy rocket in their backyard, so to speak. When they build another one (and keep it secret from the officials, though two men do stay in the town to report back but they are presented as clowns, with the Darth Varder theme for their mobile phones), credibility is more than strained. Father and son have also developed a successful system for radio contact. It’s not giving away too many secrets to say that the mission is a success. Charlie has had a peak experience and shown that any dream is achievable. In searching for what American reviewers thought of the plot, I noticed that one used a word that I would not normally use, but one which does seem apt. Despite the niceness, it is ‘wacky’. 1.The impact of this drama, American dreams? The rocket called The Dreamer? Achievement of dreams, no matter what? The credibility for a non-American audience? 2.Texas locations, the open range, Charlie riding, his astronaut suit, the family home, the town, offices and shops, the barn, the rocket, the NASA control? The musical score? 3.The title, its ambiguity, Charlie Farmer and his being an astronaut as well as a farmer? 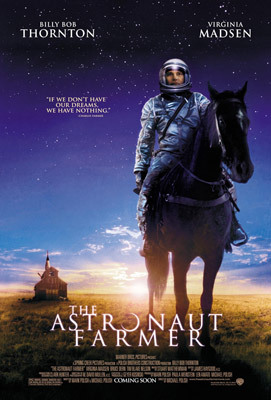 4.Billy Bob Thornton as Charlie, his screen presence, style, manner, as a farmer, riding the range, his astronaut suit, his background? His relationship with his wife, children? The table game about the rocket and the moon? The plan for the rocket? Work and skills? 5.The information about the rocket getting out, the townspeople’s reactions, Phyllis at the diner? Audie and her working at the diner? The reaction of the townspeople, the bankers and the loan, the lawyer and his help, the shops, the banners – and their being taken down after the failure? 6.The Farmers’ financial situation, the loan, the money being demanded? The comment of the welfare worker to Audie in the diner? The pressures on the family? 7.FAA director Jacobson and his attitudes, taking a hard line, the confrontation with Farmer, the hearing and his reactions? 8.Bruce Willis, the astronaut, coming as a friend, chatting with Charlie, sharing experiences, appealing to reason, looking at the rocket, the admiration, the hearing and his appeal to commonsense? His later satisfaction with Charlie’s achievement? 9.The effect on Charlie, the tension, the memory of his father and his suicide, the discussions about his achievement, giving in? The cemetery? The visit of Hal, his love for his daughter, his grandchildren, support of Charlie? Encouraging him in the project? His death and funeral? 10.Charlie’s decision to blast off, the effect, the errors, the destructive path, the injuries, his being in hospital? His life not in danger? 11.Audie, as supportive wife, loving her husband, her relationship with the children, her love for her father, her work? At home? Her receiving the money from her father? Her decision about the rocket and supporting Charlie? 12.The building of the rocket, Shep and his help, the achievement, the radio contact, the countdown, the success of the blast-off, the experience of the trip, in space, losing contact, returning, landing? The achievement for Charlie? The family waiting, their happiness on his return? 13.Jacobson and his denying that the blast-off had happened? The NASA officer and his appreciation? 14.The background of the people in the town, Phyllis at the diner, Kevin Munchak and his assisting Charlie at the hearing, support for the family? 15.The comic agents, in the town, their Darth Vader theme for their mobile phones? The mockery of the agents? 17.The issue of dreams, possibilities, the relentless pursuit of dreams, no matter what? Achievement? The realistic nature of the film and the storytelling combined with the fantasy and the touch of mysticism?